My name is Norah, I live in Stroud in Gloucestershire and have been making baskets for 30 years. My baskets are made from stripped and unstripped willow - mostly grown on the Somerset levels, but with some unusual colours from Herefordshire and Powys. 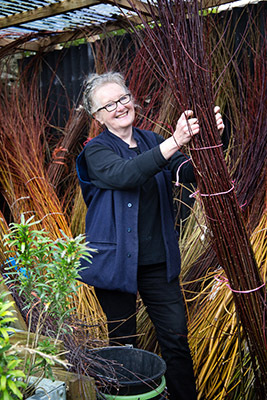 The appeal for me in working with willow lies in the combination of natural materials and traditional skills. I make baskets to order that "are right in themselves and good for use". I am interested in reviving some of the many traditional uses for willow that have been forgotten in an age of synthetic materials. I make a variety of baskets for sale or commission, contact me for more details. As well as creating baskets/willow work of all shapes and sizes, I like to share my skills with others at willow weaving workshops. I offer a range of courses where you can make a wide variety of willow work - see photos. Many courses run regularly at different venues (see links) or for details of all the courses currently available please contact me. I regularly give talks to a wide range of groups on basketmaking and am a registered speaker with the WI. Contact me for more details. I have run lots of tailored	courses for gardening groups, WI's and many more. Please contact me for more details or to arrange a workshop.